Some manufacturing plants can take advantage of relative price differences and cope with supply shortages by switching the fuels used in their furnaces, boilers, ovens, and other combustors. In the United States, the capability of the manufacturing sector to switch the fuels it uses has declined in recent decades, as described in a new report from EIA’s 2014 Manufacturing Energy Consumption Survey (MECS). Among the most commonly substitutable fuels used in U.S. manufacturing, the amount that could readily be switched in less than 30 days dropped from 24% in 1994 to 10% in 2014. Reduced fuel-switching capabilities leave manufacturers less able to respond to changes in regulations and market conditions. In 2014, the reason most cited by respondents for not being able to switch fuels used in U.S. manufacturing was that the equipment onsite would not support it. That reason accounted for 78% of unswitchable natural gas consumption, 75% of unswitchable electricity receipts, and 62% of unswitchable coal consumption. Other reasons for being unable to switch fuels included lack of availability of alternative fuels, environmental restrictions on alternative fuels, and restrictions of long-term contracts. Energy consumption in the U.S. manufacturing sector depends on the production level of manufacturing, energy efficiency, and the mix of industries in the manufacturing sector. Natural gas, the most commonly used fuel in manufacturing, increased as a share of total U.S. manufacturing energy consumption from 35% in 2006 to 39% in 2014. The shift away from using other fossil fuels in U.S. manufacturing, such as coal and petroleum products, was the result of increased availability of natural gas, lower natural gas prices relative to other fuels, and the ability of manufacturers to comply with environmental regulations when using natural gas. These factors led manufacturers to focus on natural gas use and to discount the value that fuel-switching capability had provided in earlier years. 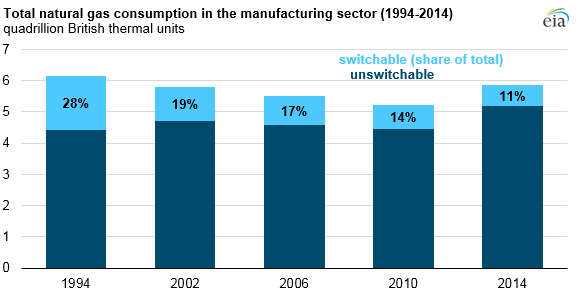 The share of manufacturing’s natural gas consumption that was unswitchable increased steadily between 1994 (72%) and 2014 (89%). 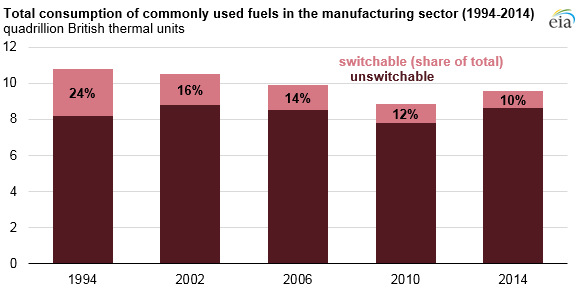 U.S. manufacturing fuel-switching capabilities vary according to industry type. 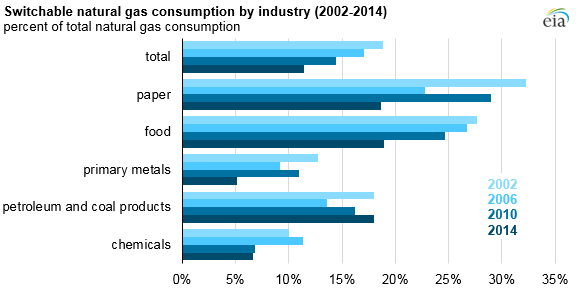 The five industries that consumed the largest amount of natural gas in the United States in 2014 were food, paper, petroleum and coal products, chemicals, and primary metals. Together, these five industries accounted for 81% of U.S. total fuel consumption and 81% of natural gas consumption in manufacturing in 2014. The chemical and primary metal industries showed less ability to switch from natural gas than the manufacturing sector as a whole in each of the four surveys between 2002 and 2014. The paper and food industries showed substantially more ability to switch. Industries that have high demand for natural gas as a chemical feedstock to make other products find it less useful to invest in fuel-switching flexibility than industries without such requirements. For example, natural gas is commonly used to produce ammonia for the manufacture of nitrogenous fertilizers. In that subindustry, 96% of the natural gas consumed as a fuel was not switchable in 2014.